*Want to keep a room full of media historians busy for hours? Just stick your head in the door, ask them, "Was KDKA the first radio station?" and run. 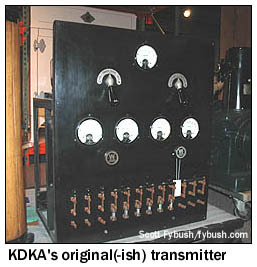 But whether or not that November 2, 1920 election-night broadcast by KDKA in Pittsburgh, PENNSYLVANIA in fact marked the start of radio in the United States (and there's plenty of well-documented evidence to suggest that everything KDKA did that night had been done elsewhere, earlier), it unquestionably marked the breakthrough of radio into the national consciousness - and thus radio's transition from a curious hobby to a new mass medium. The Westinghouse publicity machine that propelled KDKA into the history books survives today under the station's current CBS ownership, and so it should come as no surprise that the station is marking tomorrow's 90th anniversary in style. In partnership with the Heinz History Center in Pittsburgh's Strip District, KDKA hosted a weekend open house that featured appearances by KDKA personalities, a slide show of the station's highlights and a display of artifacts that included that transmitter shown above, a 1930s-era replica (including some original parts) of the transmitter used on that fateful night in 1920. The celebration continues Tuesday with live broadcasts from the Heinz center, featuring Marty Griffin, Robert Mangino and Rob Pratt from 9 AM until noon and Pratte, Mike Pintek and Bill Rehkopf from noon until 3 PM. And while 90 is a somewhat awkward anniversary (one that will be marked over the next year by a few other stations around the region, including New York's WABC, ex-WJZ, and Boston's WBZ), we're already starting to wonder what KDKA might have in store when it hits its centennial just a decade from now...and whether the KDKA of November 2020 will even still list "AM 1020" alongside all the other outlets (KDKA.com streaming audio and several HD-3 simulcasts) that are already part of today's KDKA branding. *A much newer Pittsburgh radio station is applying for a power increase. WPKV (98.3 Duquesne), which is still owned by Keymarket despite being operated as a "K-Love" outlet by EMF Broadcasting, moved into the Steel City a few years ago as a class A signal, running 1 kW/807' from a site in the North Hills. Now WPKV is applying to boost that signal to 3.7 kW/807' from the same location, which would significantly increase K-Love's reach into the Pittsburgh suburbs. To make the A-to-B1 upgrade possible, EMF will move its own WKEL (98.5 Confluence) away from Pittsburgh, shifting the class A signal about 15 miles to the east along the Maryland border, while Keymarket's sister company Forever will accept short-spacing to its own WGYI (98.5 Oil City). Up in Kittanning, Family-Life Media-Com will pay $150,000 to acquire WTYM (1380) from Vernal Enterprises after the death of Vernal owner Larry Schrecongost; Family-Life has been operating WTYM under an LMA since June. In Lock Haven, there are new calls at WSNU (92.1): it's now WSQV, a callsign used back in the eighties along US 220 by the station that's now WVRT (97.7 Mill Hall/Williamsport). 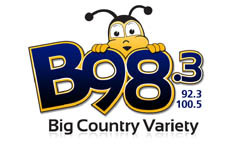 South of Williamsport, there's a new identity for the trio of Susquehanna Valley FM stations that had been known as "BIG Country Radio." As of midnight, WWBE (98.3 Mifflinburg), WLGL (92.3 Riverside) and WYGL-FM (100.5 Elizabethville) are now "Central PA's New B98.3," still playing country, but with new imaging from voice guy John Willyard. PD RJ Jordan says the station's schedule will be shifting soon, too, as he takes on an airshift - and if you're thinking the combination of RJ and a country station called "B" sounds familiar, you're not imagining things: Jordan programmed another successful country "B," Syracuse's B104.7 (WBBS), for many years. *In Philadelphia, Christmas tunes have arrived on the radio dial - not on the analog side, at least not as of late Sunday night, but on three HD2 subchannels. WPEN-FM (97.5 Burlington NJ) resurrected the very same Christmas programming (imaging and all) that it was running on 97.5-HD2 last year as "Now FM," WNUW, and Greater Media is reportedly simulcasting that relic of "Now FM" on the 95.7-HD2 of WBEN-FM. Meanwhile, Jerry Lee's WBEB (101.1) has put Christmas music on 101.1-HD2. Radio People on the Move: Shila, who'd been a co-host of the Danny Bonaduce morning show on WYSP (94.1), has moved across town to WRDW (Wired 96.5) to co-host mornings with Chio. *The FCC is out with another batch of "tentative preferences" among competing applicants for noncommercial FM signals. KC Club, Inc. (that's "Knights of Columbus," which means Catholic radio) won out for 90.3 in Bellefonte, where it will run 2 kW; in Erie, several applicants were rejected in favor of a new signal across the state line in Geneva, Ohio. *Plans are still coming together for next weekend's commemoration of the 75th anniversary of Major Armstrong's 1935 introduction of FM radio - but here's what we do know so far: starting at noon on Saturday (Nov. 6), the Major's old 42.8 megacycle frequency will light up once again from his tower in Alpine, NEW JERSEY, as experimental station WA2XMN once again takes to the airwaves. The WA2XMN website at wa2xmn.ar88.net is once again active, and Steve Hemphill tells NERW that QSLs will be issued for reception of the broadcast. Programming will include encores of the broadcast made in 2005 for the 70th anniversary of FM, and Hemphill will run the afternoon's shows once again later in the day. Stay tuned here and at our Twitter feed for more updates as they become available! *Calvary Chapel of Montclair was picked as the FCC's "tentative preference" last week for a new 60-watt signal on 90.3 in Taylortown, north of Dover in northwestern New Jersey. *And we note the passing of the former president of the New Jersey Association of Broadcasters. Philip H. Roberts died last week after suffering a heart attack while vacationing in Canada. Roberts retired from the NJBA in 2007 after more than a quarter of a century with the group; he was 73 and had been suffering from heart disease. *The big news this week out of MASSACHUSETTS is all about Catholic radio, starting at 1060 on the dial this morning at 8. That's when WQOM (1060 Natick) will return to the airwaves as an all-Catholic outlet of Buffalo-based Holy Family Communications. The inaugural program on WQOM will be a live Mass from the Cathedral of the Holy Cross, celebrated by Boston Archbishop Cardinal Seán OMalley, and while the station is boasting "50,000 watts of power," it's still not clear whether construction has been completed (or even begun) on the station's full daytime facilities at the Ashland transmitter site, shared with WAMG (890 Dedham), that it's been using for nighttime operation. In its prior incarnation as WBIX, 1060 transmitted by day from the old WKOX (1200) facility in Framingham, but WQOM didn't pick up the lease on the studio/transmitter facilities there. Over in Worcester, Catholic programming is coming to WNEB (1230) as Blount Masscom sells the 1000-watt signal to a new company called Emmanuel Communications. Emmanuel will pay $500,000 for WNEB, which presently does Spanish talk as "Radio Sol." *On the web, CBS has combined some of its Boston properties under one virtual roof: CBSBoston.com brings together the online presences of WBZ (1030), "Sports Hub" WBZ-FM (98.5), WBZ-TV (Channel 4) and WSBK (Channel 38), joining similarly united (and, if you ask us, similarly generic) portals for CBS stations in New York, Philadelphia, Chicago, LA and San Francisco. *Jean Fairbanks is coming back to NEW HAMPSHIRE after a few months away in Philadelphia. The former WKNE (103.7 Keene) morning co-host starts today as morning news anchor and news director at WKKN (101.9) across town. *VERMONT Public Radio's application for 89.1 in Middlebury won out over 23 other applicants (including several other VPR proposals) in a monster of a mutually-exclusive application pile-up that stretched from Vermont all the way to Rome, New York. The new signal will be VPR's second full-power FM in Middlebury, joining VPR Classical outlet WOXM (90.1), which signed on earlier this year. *We start our Empire State coverage in western NEW YORK, where "Slick Tom" Tiberi is back on the air at WGRF (96.9), two years to the month after losing his evening airshift on "97 Rock" to Citadel budget cuts. Tiberi tells the Buffalo News he's being paid less now than he made when he was dismissed in 2008 - but he's happy to be back on the air at all, connecting with a fan base that stayed with him during his absence through podcasts on Tiberi's website, slicktom.com. A call change nobody's likely to notice: Family Life Ministries has flipped the calls at two as-yet-unbuilt signals: it will now be WCOM on 89.3 in Silver Creek, south of Buffalo, and WCGM on 91.7 in Belfast, in Allegany County. *Radio People on the Move: WGY (810/103.1) morning host Don Weeks will leave some big shoes to fill when he does his last broadcast on Christmas Eve, but the Clear Channel talker is hoping Uncle Don's audience will stay with the station as it puts another familiar voice in the slot: Chuck Custer, WGY's longtime newsman, will co-host mornings with Kelly Lynch, late of WNYT (Channel 13). Meanwhile, Jackie Donovan moves from Pamal's Albany Broadcasting cluster (at WKLI 100.9) to mornings at Pamal's WFFG (107.1) in Glens Falls, where she replaces Kate Sullivan, who's moving to afternoons. *In central New York, there were some tense moments last Monday when things went terribly wrong for a tower crew working on the tower behind the Smith Hill studios of Utica's WKTV (Channel 2). Three workers from Alpha Antenna Services were replacing the old W59AU (Channel 59) antenna at the top of the tower with a new antenna for W22DO-D, the new digital translator for Syracuse's WCNY, when the antenna buckled, sending the tower workers falling as much as 40 feet. One worker suffered injuries to his face; two others suffered minor injuries and one was back on the job a few days later, reports CNYRadio.com. As for the broadcast services from the tower, WCNY's radio outlet, WUNY (89.5), was off the air for a few hours on Monday, as was WXUR (92.7 Herkimer), which shares the tower. 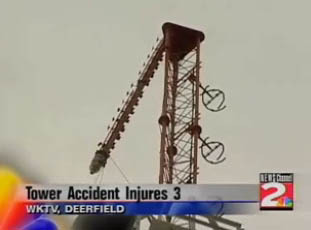 WKTV itself broadcasts from a tower in Middleville, so its broadcast signal was never disrupted, though programming switched to the automated CW feed (usually on 2.2) while the building was evacuated during the incident. WCNY hopes to have the new W22DO-D signal on the air within a couple of weeks. Central New York's WRVO network has a new leader: SUNY Oswego has named its assistant provost, Dr. Michael Ameigh, to replace John Krauss as general manager of the WRVO stations. He's only the third GM in the station's 41-year history. Down the Hudson Valley, WGNY-FM (103.1 Newburgh) has new calls: it quietly became WJGK last week. Even though it's never been heard on the air before, that callsign (which stands for owner Juergen G. Klebe) isn't really new to the valley: it resided on two never-built construction permits Klebe obtained for stations that would have operated at 1200 on the AM dial. Is it being warehoused at 103.1 for use on Klebe's newly-granted CP for 98.9 in Rosendale - or will the Rosendale FM become WGNY-FM when it signs on? *In New York City, WWRL (1600) is shifting its schedule as veteran talk host Errol Louis departs for a new job as anchor of NY1's "Inside City Hall." Mark Riley moves from evenings to mornings to replace Louis, and that frees up the 6-8 PM slot for the return of syndicated talker Randi Rhodes, effective next week. *The end of an era in CANADA: Andy Reid sends along word that the five towers of CKRU (980) in Peterborough, Ontario were torn down last Monday (Oct. 25), just over a year after the AM signal left the air, leaving Peterborough an FM-only city. 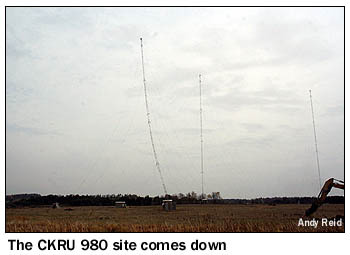 The CKRU towers were the last remaining AM facility standing; Peterborough's other AM, CKPT (1420), took its towers down as soon as that station's move to FM was complete back in 2008. *Up north in Renfrew, Ontario, My Broadcasting Corporation is asking the CRTC for more power on CHMY (96.1). "My FM" wants to boost its power from 1660 watts to 7.1 kW/128.5m, non-directional. It was a roller-coaster of a week for fans of dance music in NEW YORK City - but as of this morning, the saga of "Pulse 87" appears to have something of a happy ending. "Pulse," of course, is (or rather "was") the high-profile not-quite-FM-broadcast-station that launched in January 2008 on the audio carrier of low-power TV station WNYZ-LP (Channel 6), broadcasting at 87.75 MHz from the top of the Citicorp Center building in Queens. Despite the odd dial position, a signal that was sometimes sketchy outside the five boroughs and a near-complete lack of the usual billboards, bus cards and other promotions that launch a new radio station, Pulse 87 built a rabidly loyal following and a respectable (if niche) audience in nearly two years on the air. What Pulse couldn't do, evidently, was to dig its owner, Mega Media, out of a financial hole that the company was apparently in even before launching Pulse. Much of the station's initial airstaff, including the flagship morning team of Star and Buc Wild, disappeared early on, and in recent weeks there was a nonstop drumbeat of rumors suggesting that Mega was falling behind on payments to its creditors - including WNYZ's licensee, Island Broadcasting, which was leasing the 87.7 facility to Mega for "Pulse." Early last week, the Pulse programming disappeared from 87.7 for nearly two days, sparking a flurry of message-board rumors about the imminent end of the format. And while that outage was apparently just a failure of the Verizon fiber circuit from Pulse's Brooklyn studios to the Queens transmitter, it did indeed presage the end of Pulse, which came abruptly on Friday. At 12:15 PM, Mega CEO Alex Shvarts took to the airwaves to announce that the station would shut down at 5 PM, thanking everyone who'd been involved in the project since its launch. At 5, Pulse said its farewells, leaving the air to the sounds of the Beatles' "Back in the USSR." Was it a tip-off to a return of the Russian pop format that had been heard on WNYZ before the launch of Pulse? Or perhaps a nod to Shvarts' own Russian heritage? The first theory was quickly dispelled when listeners to 87.7 heard dance music continue on the frequency after a few minutes of silence, albeit at a lower volume and with just an hourly ID. (Meanwhile, Pulse itself kept putting out music and liners on one of its streaming feeds well into Friday night.) As Pulse fans gathered for a farewell party Saturday night, their mourning was turning into celebration as word spread that Long Island's JVC Broadcasting had signed a deal to take over the lease of WNYZ, using the frequency starting Monday morning as a New York City relay of its "Party 105." While "Party" isn't a pure dance station, mixing hip-hop in with the rhythmic tracks, it comes to 87.7 with well-known leadership behind it, including JVC vice president/Party morning man Vic Latino, a popular figure in New York's rhythmic music community. "We are very excited to be broadcasting to the number one market in the world," said JVC CEO John Carraciolo. The simulcast comes amidst several other changes for "Party 105": earlier in the week, it changed calls from WDRE to WPTY-FM - and after a simulcast period, it will disappear from one of the Long Island translators that was carrying its signal west. W268AN (101.5 Plainview) will instead flip to a simulcast of JVC's other Long Island signal, Spanish tropical "Fiesta" WBON (98.5 Westhampton), which is already heard on another translator at 96.9 in Manorville. The new "Pulse 87.7" simulcast is expected to launch this morning at 6 with "Vic Latino's Neighborhood." There's a format flip coming to NEW HAMPSHIRE's Lakes Region on Wednesday, when classic rock "Hawk" is set to move from WWHQ (101.5 Meredith) to WLKZ (104.9 Wolfeboro). There's no word yet on what's in store for 104.9 as Nassau shuffles its lineup in preparation for shedding several of its Lakes Region and Concord signals. While it may strike terror into the souls of classical music aficionados across Eastern New England, the news that Charles River Broadcasting has put its station group up for sale is anything but a Halloween prank. On Thursday, the company's board of directors agreed to hire Media Services Group to explore the sale of some or all of its five stations - classical outlets WCRB (102.5 Waltham), WFCC (107.5 Chatham) and WCRI (95.9 Block Island RI), as well as rocker WKPE (104.7 Orleans) and all-news WCNX (1180 Hope Valley RI). The board also brought in veteran manager Herb McCord (former head of the Granum group) to manage the stations while CEO Bill Campbell is on medical leave; McCord was already a member of the Charles River board. At least where WCRB is concerned, the move appeared at first glance to contradict the wishes of Theodore Jones, the station's founder. At the time of his death in 1991, it was widely reported that he'd created a trust structure to ensure that WCRB would remain classical for the next 99 years, leading many in the business to believe that the station (with one of only a dozen or so truly full-market Boston FM signals) would never go up for sale. Charles River, however, sees things differently. Company officials say it's become impossible to operate as a small group in the era of consolidation and clusters, and they tell the Boston Globe that when Jones died, the trust he created stated that it was his "wish" that WCRB remain classical - but not a binding order. The board believes it can honor that wish by mandating that anyone buying WCRB maintain the classical format on an HD Radio subchannel, but leaving them free to program whatever they'd like on the main channel. So who'd be in line to spend the likely $70-80 million - perhaps even more - that the WCRB signal would fetch on the open market? While Infinity and Greater Media are at their market ownership limits already, two other big groups already in Boston - Clear Channel and Entercom - still have room under the caps to take on an additional FM signal. To that list, we'd also add Radio One and Salem, both of which have footholds in the Boston market and which have been acquisitive elsewhere. And we can't leave out Marlin Broadcasting, which has deep Boston roots (in the person of principal Woody Tanger), deep classical roots (it owned - then sold - classical FMs in Philadelphia, Miami and Detroit, and it still owns classical webcaster beethoven.com and WTMI 1290 in West Hartford, Connecticut), and which wasted no time at week's end making it known that it's actively attempting to buy the Charles River stations. Or - and this is purely speculative, we'd emphasize - could some sort of nonprofit ownership coalesce to preserve WCRB's format? The Boston Symphony Orchestra is already a part-owner of Charles River. (Its counterpart in Seattle is a key player in the nonprofit that owns KING-FM.) Then there's WGBH, which continues to have a committment to classical music even as it tries to balance other programming on its FM outlet. Was the $4 million that 'GBH just spent on a new Cape Cod FM merely an appetizer for something much bigger in Boston? What about the other Charles River outlets? Nassau's just begun to make inroads on Cape Cod, and it's flush with cash (or soon will be) from the sale of its Lehigh Valley cluster in Pennsylvania, so it's not hard to imagine that two more big FMs would make an appealing investment for the growing company. We're not even going to try to speculate about the little signals in southern Rhode Island, where anything could happen, and probably will. WCRB's only one big headline in eastern MASSACHUSETTS this week, though. Up in Burlington, things got awfully quiet Thursday at WWZN (1510 Boston), where Sporting News Radio abruptly pulled the plug on the local programming it was originating at "1510 the Zone." At the end, that meant two shows for the struggling station: "The Diehards" and Eddie Andelman's afternoon show. The paid programming that was running on the weekends and some evenings (including high school football) will continue, as will three WWZN staffers, including Diehards Anthony Pepe and Jon Anik. A few moments of class marked the station's end: former GM Mike Winn, who's now with "ESPN Boston" WAMG/WLLH, was allowed to come back to WWZN for the last day there. And Andelman, whose history on Boston radio goes back 36 years, will get to do a farewell show Thursday (Nov. 3) from 2-4 PM. After that, it's anyone's guess - there's pretty credible word that Sporting News Radio itself is struggling, raising questions about whether even the network sports feed will continue on what's now the number-three sports outlet in the market. There's still another format change to note in the Boston market: no sooner did Radio One flip WILD (1090 Boston) to a black gospel format than it announced the impending debut - sometime in early 2006 - of a national talk network aimed at black listeners. WILD will be an affiliate of the network, of course, which means Boston listeners will get to hear the new Al Sharpton show from 1-4 PM, as well as "Two Live Stews" (a fast-growing sports talk show from Atlanta) from 4 until sunset, a yet-to-be-named national host from 10 AM-1 PM, and a yet-to-be-named local host in the mornings. We'd bet the black gospel continues on weekends. Then there's Howard Stern, who took away whatever suspense still surrounded the question of his replacement on Tuesday, when he introduced David Lee Roth as his successor, starting January 3, 2006, on most of his East Coast Infinity-owned affiliates. In Boston, that means Roth will replace Stern on WBCN (104.1), but WBCN's rock format will continue for the rest of the day. That's not going to be the case on several other Stern stations - in particular, NEW YORK, where the end of the Stern show will also mean the end of "K-Rock" at WXRK (92.3). Stern has been a part of K-Rock since just a few months after it signed on in 1985. After he signs off in December 16, the rock will go as well - at least during the day - to replaced by the "Free FM" brand of talk that Infinity's launching in other big markets. So far, the only host confirmed for WXRK (besides Roth) is comedian/magician Penn Jillette. The Roth show won't be heard in upstate New York. Instead, WZNE (94.1 Brighton) will bring "Rover's Morning Glory" to the Rochester market. Rover is the "nom de chien" (thanks to Ohio Media Watch for that one!) of Shane French, who's been doing mornings on WXTM in Cleveland. His show will now be based at "Free FM" Midwest hub WCKG in Chicago, where it will feed WXTM, WZNE and affiliates in Columbus, Cincinnati, Detroit and Memphis. Back to Stern, then - and perhaps the biggest news, at least in our region, comes from eastern PENNSYLVANIA, where the end of the Stern show Tuesday was followed with the launch of "94.1 Free FM" on WYSP (94.1 Philadelphia). The new format had clearly been in the works for a while, since it launched with a relatively comprehensive schedule. The most notable addition is market veteran Paul Barsky, who resurfaces as the 10 AM-3 PM host (with former sidekick Vinnie the Crumb alongside him again.) Kidd Chris, already on WYSP, remains in afternoon drive. After 7 at night, the station will still be a rocker, with Couzin Ed moving to 7-10 PM and Matt and Huggy from 10-2. WYSP also brings a familiar Infinity face back to the market: Tom Bigby, who moved from WIP to KRLD in Dallas last year, returns as OM of "94.1 Free FM." Gil Edwards moves up from APD to PD. The rock will live on - albeit jockless - at WYSP.com; we'd sort of expect it to show up as an HD Radio multicast eventually, too. At the other end of the state, we've heard that Infinity was all set to flip WRKZ (93.7 Pittsburgh) to "Jack" - after all, the station was created out of the ashes of the old B94 specifically to carry Stern last year - but instead, it's sticking with "K-Rock" on the frequency, at least for now. David Lee Roth will be the morning man there, as well as at WYSP. A former MASSACHUSETTS broadcaster is making some awfully loud noises against Clear Channel as his U.S. Senate campaign in Florida heads for the finish line. Here at NERW Central, we were paying only a little attention to the charges independent candidate Andy Martin was making about Clear Channel's contests. If you haven't been reading the national trades all week, they boil down to this: not only is Clear Channel trying to pass off national contests as local ones, but the company is also rigging those contests to favor certain markets. Florida's attorney general already reached a settlement with Clear Channel on the former allegation, of course, but Martin claims the company isn't running the required disclaimers as promised. Clear Channel, of course, denies the allegations. But in doing so, the company mentioned in passing that "Andy Martin" is also known as...Anthony Martin-Trigona. That's a name we do recognize: Martin-Trigona bought WHET (1330 Waltham) in the late 1970s and flipped it to country as WDLW, the calls it would use for more than a decade (and which calls supposedly refer to the initials of an ex-girlfriend of Martin-Trigona's!) By whichever name you call him, it seems Martin-Trigona has had a colorful career since selling WDLW in the early 80s, including real estate deals and politics in Illinois, and several run-ins with the Florida court system for filing frivolous lawsuits and such. Martin's official campaign website makes no mention of WDLW or of the "-Trigona" part of the name, but it certainly appears that we have an interesting answer to at least one Boston radio "where are they now" question. The big news in the Big Apple this week was the death of Frankie Crocker at age 63. Crocker spent almost two decades as program director and afternoon jock at WBLS (107.5), in two separate stints at the station. His resume also included stops at WWRL and WMCA, and most recently at WRKS. Crocker died last Saturday (10/21) in Miami.